Living off the grid means living resourcefully and efficiently. You will need to be creative in order to save energy and to heat and cool your home. 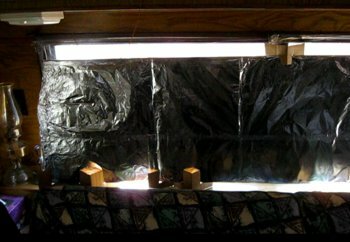 Passive solar window heaters are easy to make and work surprisingly well considering their simplicity. Look for a south facing window that gets a lot of sun, especially in the morning hours when you need heat the most. For this project all you need is a piece of cardboard that fits the window you want to put the heater into. If you have a large box, open the box and lay it out on a flat surface. Trim off the excess cardboard so that it fits in the window frame with about an inche of space on the top and the bottom of the window. You need to leave a little bit of air flow under the window and then again on top. Pull out a sheet of aluminum foil long enough to cover one side of your cardboard and overlap on the edge about half an inch on both ends. Tape the foil onto the cardboard. Cover the whole side of the cardboard with foil. Then tape it well along all the edges to prevent snags in the future. You can cover both sides of the cardboard with aluminum foil. One side will be the heater side and the other, optional side, will reflect heat energy back into your home, preventing it from escaping through the window. If you choose to go with the optional radiant method, simply cover the other side of the cardboard with aluminum foil. Now you should have all the cardboard covered on both sides. Either way you go with the foil, now you can proceed to the next step. Paint the foil on one side with black paint. A flat black paint is better and will absorb more heat from the sun. Make sure you paint the foil well so no aluminum shines through. Let the paint cure outside for a while. Leave it out for a couple hours in the sun. It smells very bad if you bring it inside too soon. Now you can place your new heater in the window and feel the heat pouring in. You will need to support it somehow so that there is an inch or two gap underneath the heater and also the same amount of space on top. You want the air to be able to flow into the bottom of the heater. The sun heats up the black foil and the hot air moves upward and out through the top of your heater. This pulls fresh cooler air in through the bottom. This is called passive heating. The sun does all the work for you. You do not need any fans or moving parts to make this heater work. You may need to tape the heater to your window frame on the sides. Or you can hang it with string. You can also cut out some cardboard feet as shown in the video below.